Saturday’s show opened with hosts Ranvir and Manish reminding the audience that there are just 7 days left for the grand finale of Jhalak Dikhhla Jaa! It was then time to determine this weeks face-off. Mouni was one of the face-off contestants but as she has the Shakti Immunity ball, she used it to be safe. This meant that the face-off would be between Shakti and Akshat! Two of Jhalak Dikhhla Jaa’s strongest contestants. The judges were very excited that Jhalak had reached the semi final stage. Host Manish reminded the audience that as Shakti did not perform last week due to ill health, she had received zero scores and so her outcome would also depend on the number of votes she received from her fans. Then there was a special performance from choreographer Ganesh Hedge who was the special guest for the episode and had also choreographed the contestants acts this week. Ganesh performed to a medley of songs including his own song ‘Main Deewana’. Ganesh then requested if he could dance with judge Madhuri as he loves the walk that she performed in her song ‘Choli Ke Peeche’ from Khalnayak. Judge Madhuri shook a leg with Ganesh on stage. The audience then learnt that there would be a new twist from the judges this week. The judges would not be giving any scores to the contestants performances in this weeks episodes. The contestants would purely be relying on the number of votes they receive from their fans. First to perform this evening was Karan Tacker and Bhawna. Their chosen dance style was freestyle and their chosen song was the title track of the first Shah Rukh Khan starrer Don. The act was ultimately choreographed by Ganesh Hedge and not Bhawna this time. The judges loved the act as they felt it was like watching a mini movie. They said Karan enacted the role of a Don very well. Ganesh said that he felt Karan was the most filmy of all the contestants hence chose this option for him. Naturally there were no scores for this act. Then it was time to welcome the special guests Deepika Padukone and Arjun Kapoor who had come to promote their film Finding Fanny. Next to perform were Mouni and Punit. Their chosen dance style was freestyle and their song was the female version of Dhan Te Nan from Kaminey. The judges said it was an amazing performance and they felt Punit stole the show (he entered later in the act). 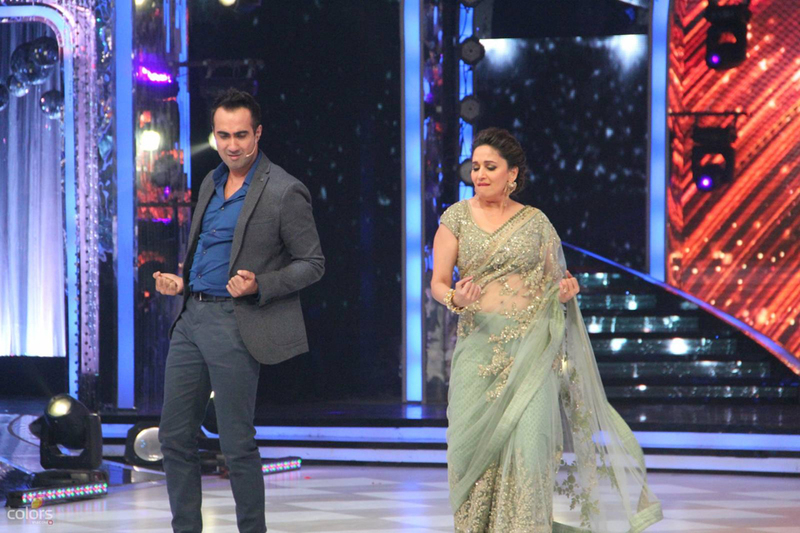 Madhuri loved Punit’s feminine walk during the act. Deepika also danced with Punit. Next on stage were Major saab Ashish Sharma and Shampa. Their chosen dance style was freestyle/MJ. This was the first time Ashish had danced like Michael Jackson. Their chosen song was ‘Chammak Challo’. 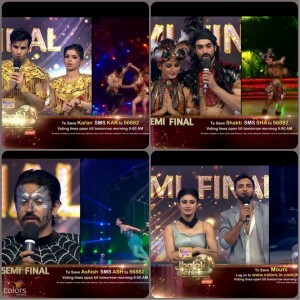 The judges loved this transformation and judge Remo said Ashish most definitely deserves to be in the finals. At the beginning of his act, Ashish was suspended upside down via an aerial and the judges felt that was a very brave thing to do. 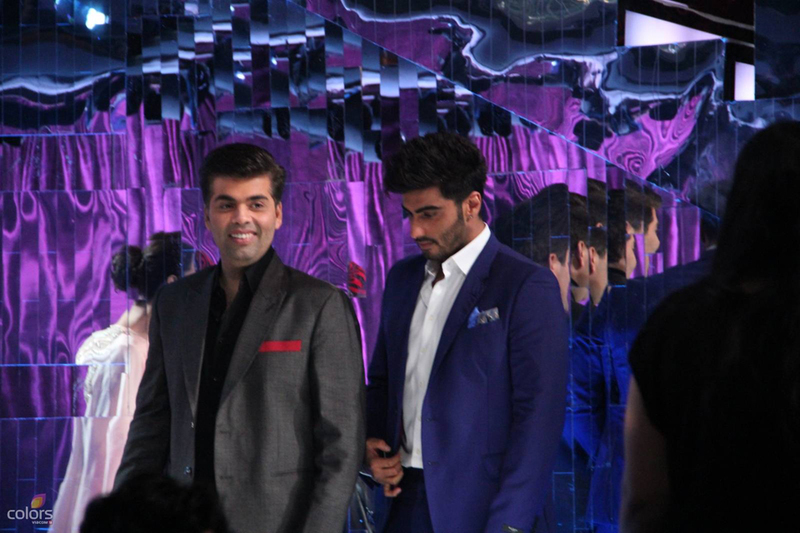 Then Ganesh enacted a scene in total MJ style (dance moves) with judge Remo, Arjun Kapoor, hosts Ranvir & Manish, Ashish and Shampa. It was hilarious to watch! It was then time for possibly one of the most toughest face-offs. Akshat and Vaishnavi were the first to perform. Their chosen dance style was freestyle and their song had no lyrics just upbeat music. Next it was time for Shakti and Tusshar. Their chosen dance style was freestyle and their chosen song was ‘Dhoom Machale’. After the judges decided, judge Remo then said he would come on stage and hug the contestant that would be eliminated. He hugged Akshat. Akshat and Vaishnavi were sadly eliminated from Jhalak. To lighten the mood, the judges, guests and Ganesh danced on stage to ‘Balam Pichkari’ from Yeh Jawaani Hai Deewani. Then it was time to watch Shakti and Tusshar perform. Their chosen dance style was freestyle and their chosen song was a medley between ‘Kambakht Ishq’ from Pyar Tu Ne Kya Kiya and ‘Mehbooba’ from RGV’s Aag. The judges enjoyed the act as Shakti had tried some very different moves. Shakti and Ganesh also danced together. Performance of the day was given to Mouni and Punit. Sunday’s episode opened with all the contestants on stage and the song ‘Aa Dekhe Zara’ played in the background. The hosts told the audience how the journey of Jhalak had reached its 15th week and that the contestants would be challenging each other in today’s episode. As mentioned in Saturday’s episode, no marks would be given. First to perform were Karan and Bhawna. The audience were shown Karan’s journey so far and were reminded that he had only received his first 30 marks during the 9th week of Jhalak. Ashish challenged Karan to dance classical as up til now he hadn’t tried this dance form yet. Karan’s chosen dance style was kalari/chau and his chosen song was ‘Dil Haara Re’ from Tashan. The judges said it was a very good performance and well choreographed by Bhawna. Next on stage were Shakti and Tusshar. 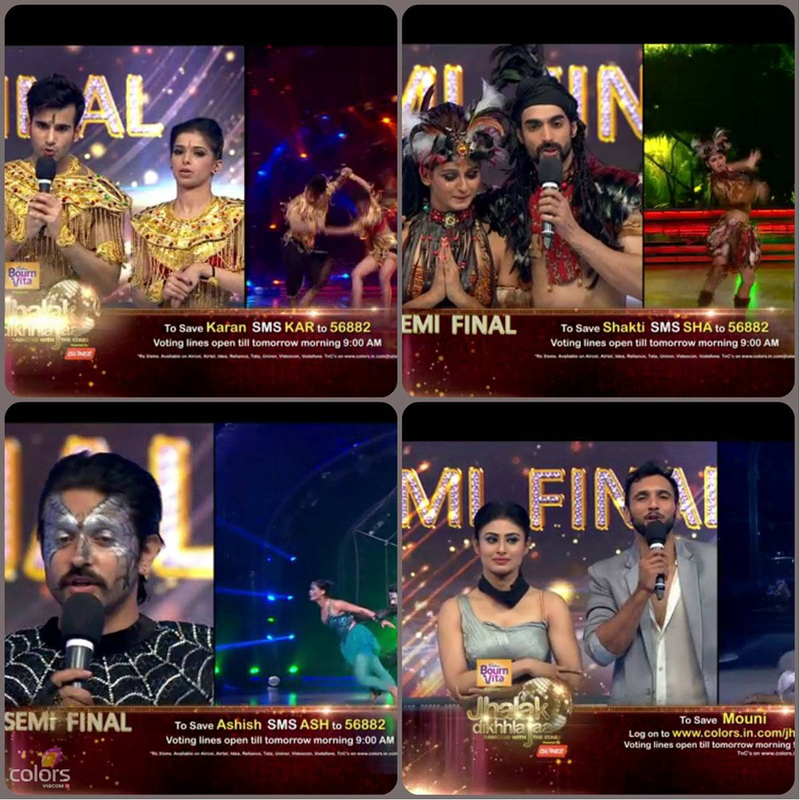 The audience were shown Shakti’s journey so far and Mouni challenged Shakti to simply dance as she knew she was recovering after being unwell. Shakti’s chosen dance style was Afro/Acrobacia and their chosen song was ‘Mashallah’ from Ek tha Tiger. The judges said there was a lot of energy in the act but one lift went wrong which could have been avoided. However, they noticed that it was Shakti who did all the lifts! It was then time for Mouni and Punit to perform. Their chosen dance style was contemporary and their chosen song was ‘Manjha’ from Kai Po Che. Karan challenged Mouni to perform where she has to rely solely on herself and for this Mouni performed her act semi blindfolded. The judges loved the timings in this act as Mouni performed a lot of lifts while she was blindfolded. Host Manish then did some fun and masti with judge Remo by showing and reminding some of the audience with his expressions. Judge Remo then challenged judge Madhuri to make host Ranvir dance. Host Ranvir danced to ‘Ek Do Teen’ from Tezaab with judge Madhuri. Judge Remo then challenged judge Karan to perform classical dance with judge Madhuri. This was hilarious to watch and bought smiles to everyones faces! Ashish and Shampa were next to perform. Shakti had challenged Ashish to perform an aerial style act which is something he has never done before. Ashish’s chosen dance style was freestyle and their chosen song was ‘Maahi’ from Raaz the Mystery continues. Their act was based on a spider catching a butterfly into its web. Ashish played the role of a spider very well. The judges loved the choreography and the spiders web theme. Then due to public demand, Akshat and Vaishnavi performed once again. They set the stage on fire (literally!) Their chosen dance style was freestyle and their chosen song was Dum title song. It was a rocking performance! The show ended with the contestants having a selfie with hosts Ranvir and Manish! Stay with BollySpice for your latest updates on your favourite show Jhalak Dikhhla Jaa!